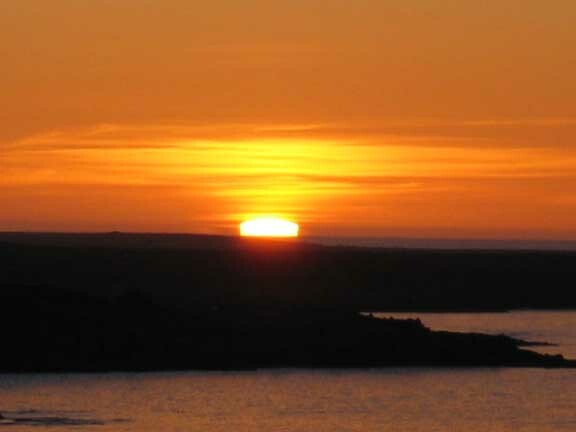 The Weather : Sunny days and calm nights with 24 hours of daylight. 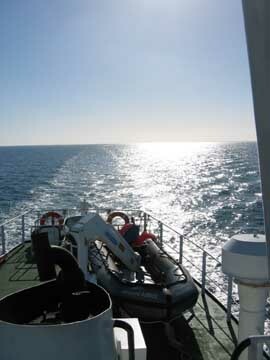 The sea journey over from Faroes was a long one of approximately thirty two hours, not that this was a problem. An early start yesterday and a calm sea all day meant we averaged nine or ten knots cruising speed and ticked off the miles. 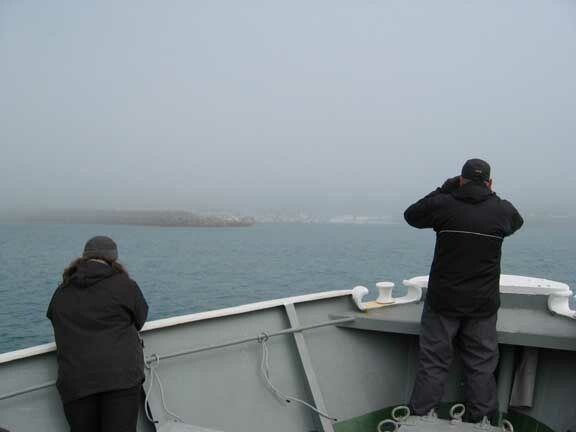 Keeping a lookout for wildlife, shipping, checking navigation on the sat-nav, and general chat accompanied by large quantities of tea, coffee and food whiled away the hours before we turned in for the night. About 4.30 am the weather took a slight turn for the worse and the sea-swell increased and mist thickened. We could forget about it by turning over in our bunks and going back to sleep. The skipper obviously did not, and a few minor course adjustments and a good set of stabilisers kept the roll to a minimum. 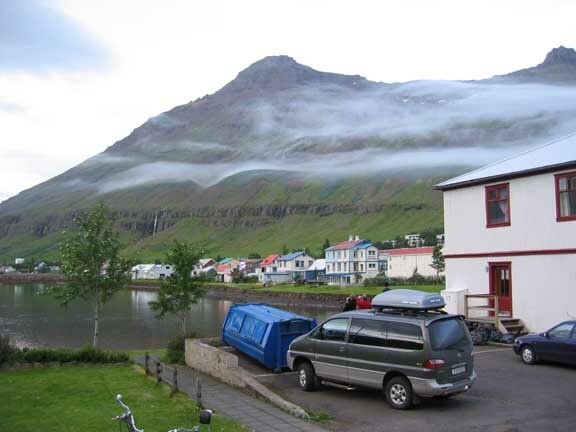 Suddenly around breakfast time the mist rolled away and we were presented with our first view of the Icelandic shore. Dramatic sea cliffs and mountains, still holding the last of the winter snow, hid the entrance to Seydisfjordur, our destination today. The lighthouse marked the way. The orange paint seemed strange, but as someone pointed out, orange would stand out well in the winter snows. Hjalmar Bjorge is on the left ! ! ! 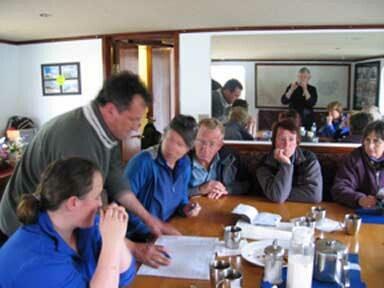 was signing customs forms for Iceland. The second job was to get out and explore . . . 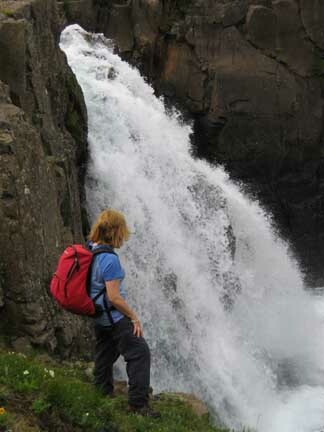 The side valley opposite the boat mooring had a good path leading up past several fine waterfalls. 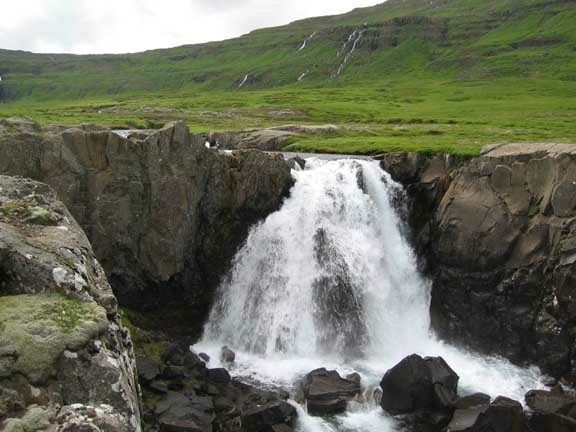 This was described on the local notice board as the old postal and trade route via Vsetdalsvatn to Egilsstadir. 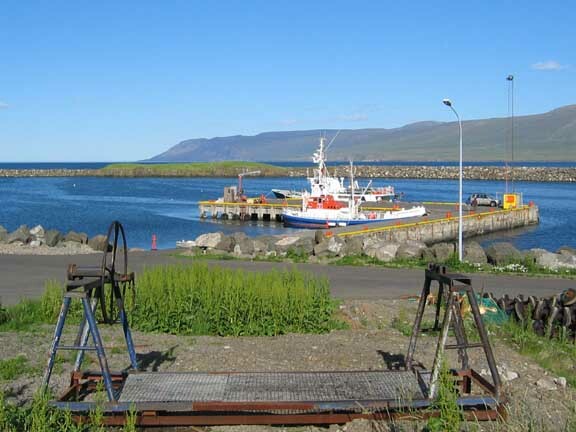 Seydisfjordur itself is now the eastern ferry terminal for boats from Scandinavia and Europe, and has recently been enlarged in anticipation of a new aluminium works in the region. Evening mist gathers as we get back to town. complete with painted wood panelling and period floorboards. Cloudy skies cleared away as we motored north the next day. Conditions were like a mediterranean cruise ! 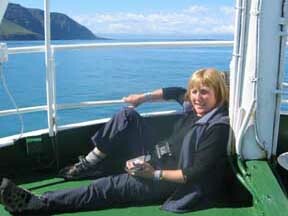 The sea was clam, the breeze was a few degrees cooler but it was still warm enough on deck to be able to relax.
" LOOK - OVER THERE "
and abundant food meant something was bringing it to the surface. 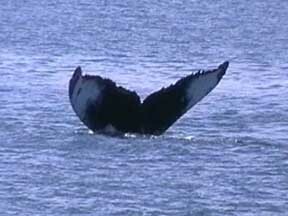 and a fine raised fluke as he / she dives. Not one but two were feeding and we diverted across for a closer look. 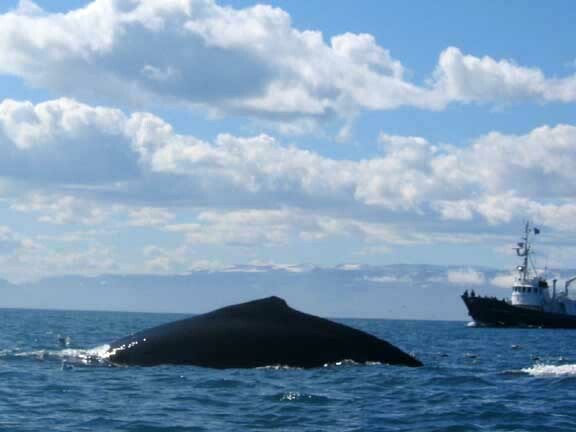 A brief stop to launch the Zodiac and then we motored a little closer to these amazing creatures. The routine they seemed to keep was to surface with a tremendous venting blow, then they would slide beneath the surface to re-appear again once or twice more . 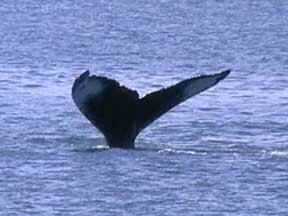 On their final go they would arch their backs and raise their tail flukes in order to dive deep once again. Catching that moment was easier said than done. 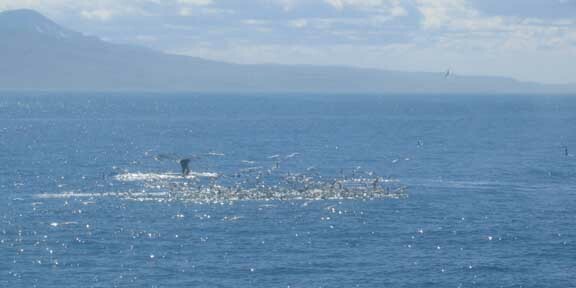 With a final tail fluke and a deep dive they were off. 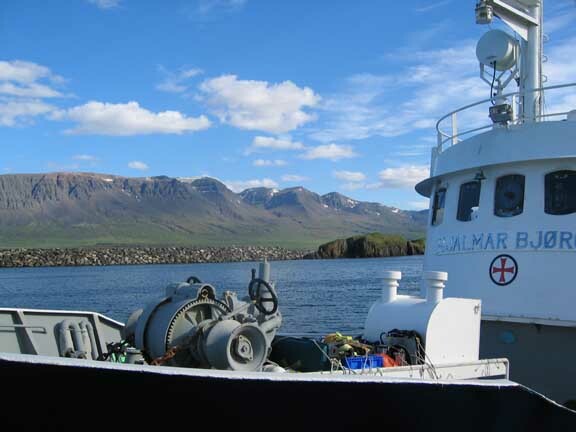 It was time for us to motor on north and round the last headland before our destination, the port of Vopnafjordur. One more surprise was in store for us, just to round off what had been a great day. This time it was dolphins not whales. 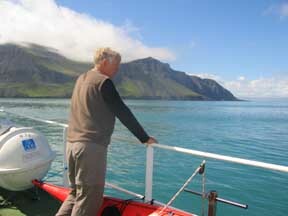 As we made our way across the last bay about six white beaked dolphins came over to join us and spent a few minutes "bow riding" Hjalmar Bjorge. They seemed to enjoy the experience and we certainly enjoyed watching them. Why they swim in this way is still a mystery, but the way they ducked and dived proved their complete mastery of their watery environment. 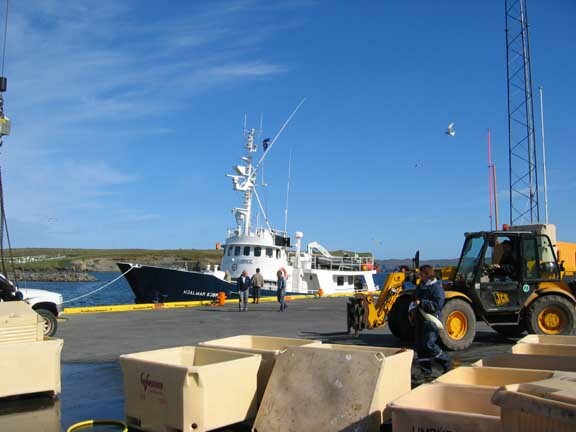 The end of the day and Vopnafjordur provided us with another safe berth at the local quay once we had worked out how to get into the harbour entrance. 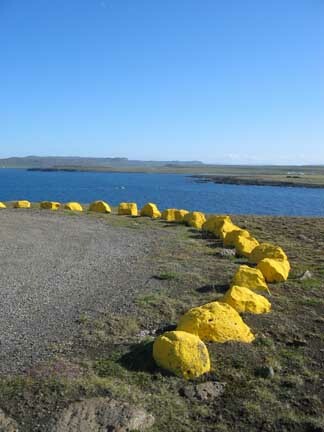 They have improved the sea defences and altered the layout since Mark's sea charts and Harbour Pilot instructions were printed. It was a slowly slowly approach until he worked out the buoyage. 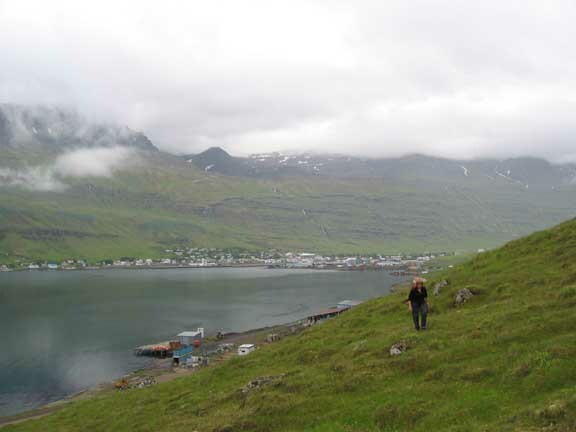 Vopnafjordur and the hills of Smjorfjoll. 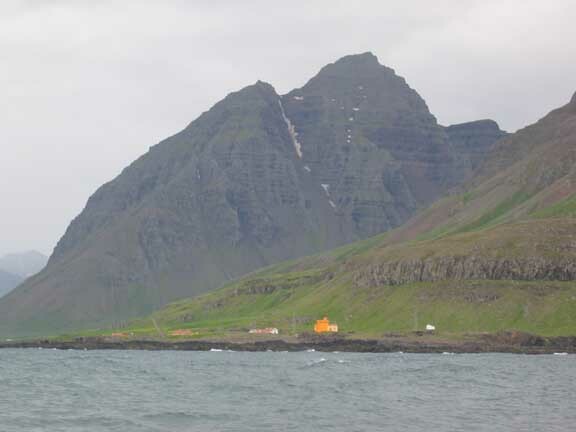 According to Icelandic legend, the mountain is home to their Father Christmas. The most north easterly headland of Iceland is an amazing flat promontory, so different from the steep mountain scenery we had seen so far on this coast. We could just imagine the lava flows and volcanic activity that laid this headland seaward in the not too distant past. The far side of the head, where the cliffs, were protected from the prevailing wind, there was a huge nesting colony of fulmars and other seabirds, white cliffs that extended over a mile down the coast. 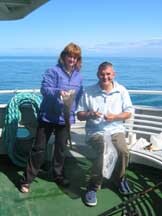 Heather, our cook, had brought a fishing line on the trip and Andy was keen to try his luck. 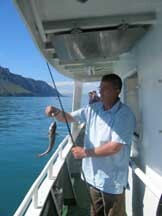 The previous day he had done reasonably well, and managed to catch his own supper. 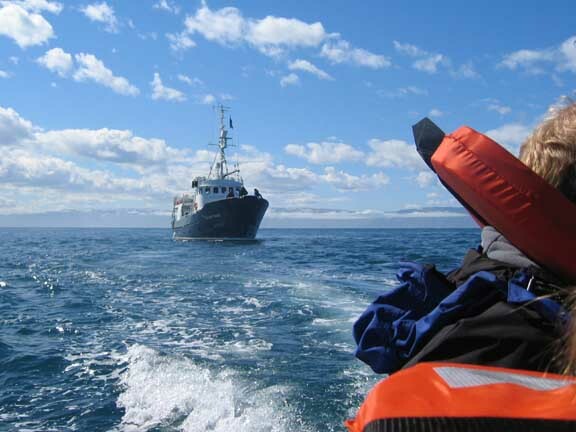 Today we were passing several local boats fishing out in deep water when we decided to let Andy try his luck again. 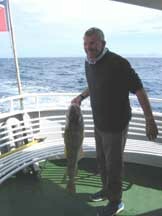 Luck it was (or was it skill) that he caught and landed a huge 20lb cod that this time provided the whole ship's company with a fine meal. At this point . . . .
may we compliment Heather and Kirsty for the tremendous effort they put in to providing us with food, morning, noon, night, and often at odd times in between as well. They coped with everyone's vegetarian, fish, no fish, meat, no meat requirements and provided an excellent selection on every occasion . . .
but you can't waste it can you ! Journey's end that day was at the most northern village in Iceland, Raufarhofn. This was the view into the harbour as we approached . 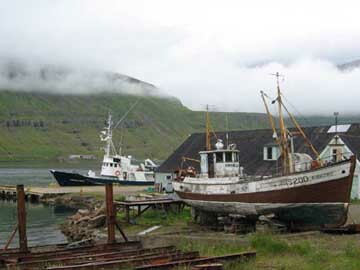 . .
A delightful Icelandic Church large and small fishing boats, and a British Arun Class Lifeboat, presumably bought by the Icelandic Rescue services for use in these northern waters. 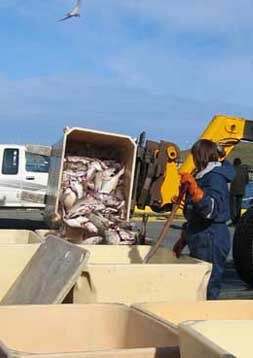 just as several of the local boats were returning to port with their catches. 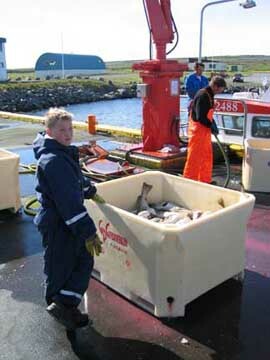 A young lad unloading the fish . . .
and a young lady ready with the ice shovel. Raufurhofn Church with a fine northern sky. Stones at the light house- art deco ? 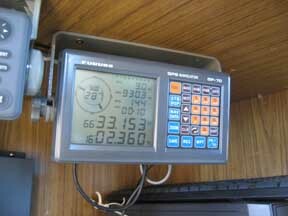 This was the furthest north we moored - just a few miles south of the Arctic Circle itself. The daylight up here at this time of year was continious for twenty four hours, and as today was a fine day, the sun was in the sky for all but ten minutes of that time. 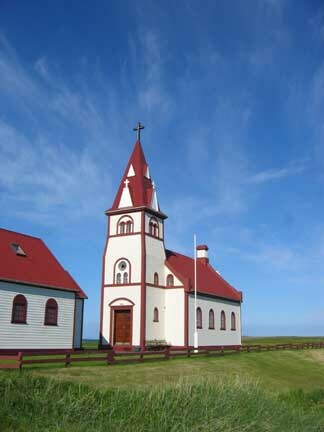 Jet lag was not a problem on holiday, Iceland runs on GMT, one hour different to UK and "Boat" time. 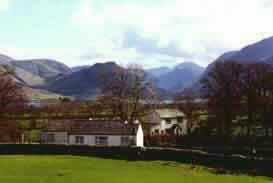 What was a problem on these long fine days was remembering to go to bed ! 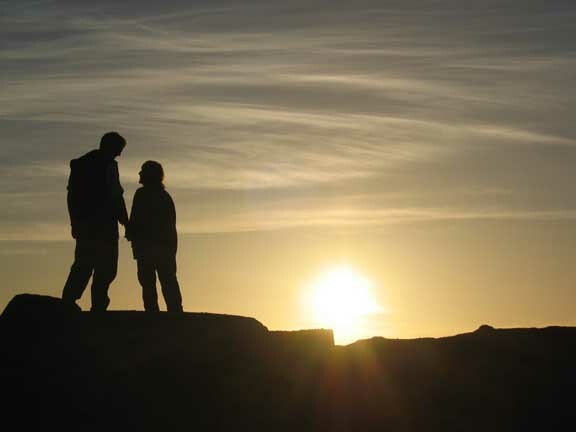 Ann and I took a stroll to the top of the local hill and enjoyed the late evening sun. 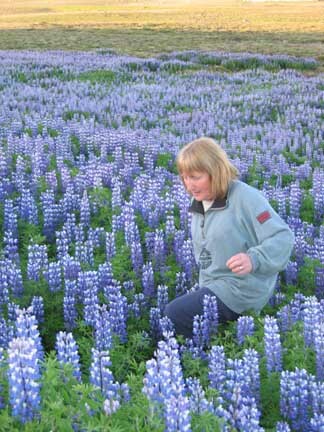 Lupines, by the way, are a prolific plant on this poorer soil. An "Ahh" moment captured with the nearly midnight sun. and captured the sun as it momentarily dropped below the horizon. Close up on the sun as it was setting. 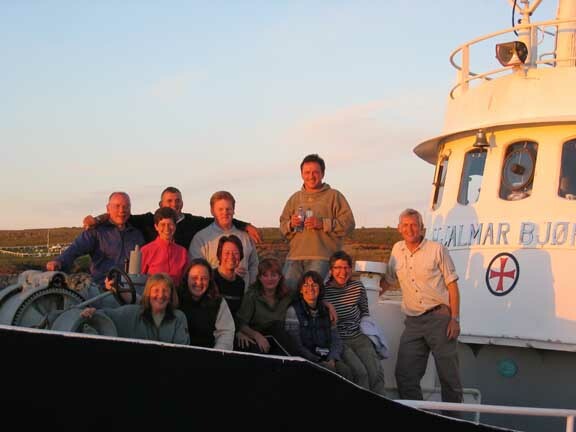 Group Photo - on deck - with the midnight sun. 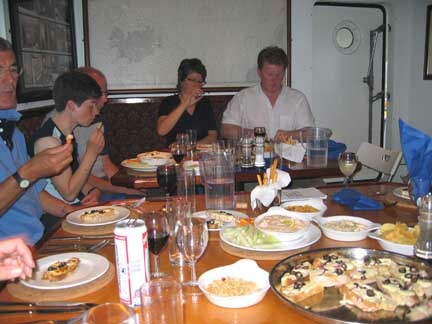 Behind: Alan and Catrin, Andy, Gavin and Mark. 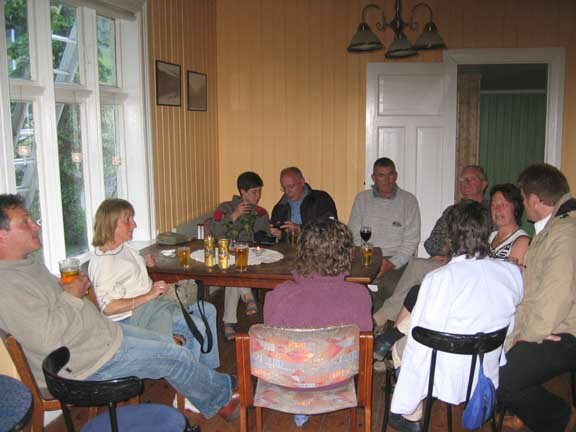 In front: Ann, Kirsty, Val, Heather, Jill, Edith and myself. 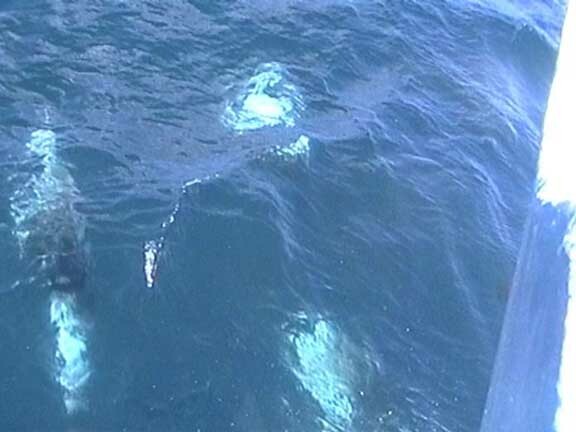 Next day . . .A further peal of the ships bell sent us running for the binoculars - Whales again ? one of the two larger ports on the northern coast. As we entered another period of sea mist, radio reports of an iceberg sent Martin rushing to the chart table, but it was a fair distance away and would be a consideration for another day. 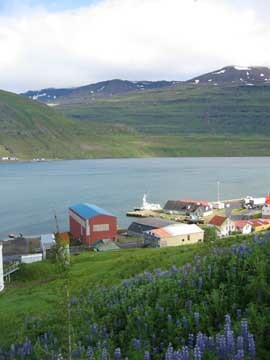 Today we continued west then southwest into Husavik Bay, only to emerge from the gloom as we approached Husavik itself.